The week after the attack on the World Trade Center, Joan Murray read her poem about it, “Survivors--Found,” on National Public Radio. 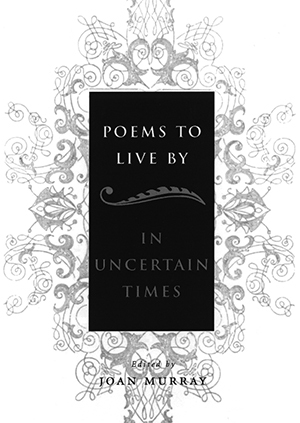 Poems to Live By features sixty of the finest poems by an international group of distinguished writers, including W. H. Auden, Czeslaw Milosz, Bertolt Brecht, Yehuda Amichai, Mary Oliver, Miguel de Unamuno, Gwendolyn Brooks, Billy Collins, Yusef Komunyakaa, and Sharon Olds. Agreeing with Kenneth Burke that literature is equipment for living, Murray has arranged the anthology in six sections that address our most urgent concerns: death and remembrance, fear and suffering, affirmations and rejoicings, warnings and instructions, war and rumors of war, meditations and conversations.